I think there’s a more practical way to explain CORS findings that others may find helpful. 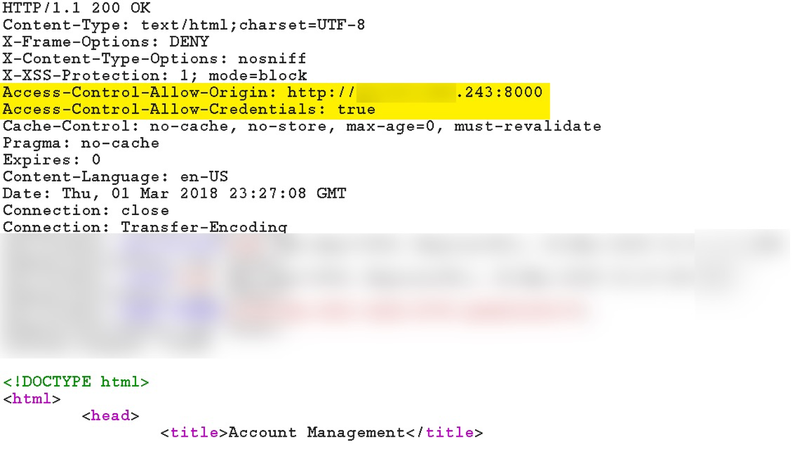 I find that many explanations tend to demonstrate what happens with CORS, but fail to demonstrate why it’s happening or where the security decisions are being made under the hood. I intend to provide the CORS explanation I wish I could have found in my own research. If you’ve ever found yourself less-than-prepared to answer prying questions about Burp Suite CORS findings, or you simply lack an instinctual understanding of Same-Origin Policy, this blog post is for you. Figure 1 – Dangit, Burp Suite! Now I Gotta Figure Out How to Explain This! Put simply for our purposes, browsers adhering to Same-Origin Policy prevent code that is running on one web site (aka an origin) from accessing HTTP responses from another web site which may contain sensitive information. Same-Origin rules are more nuanced than this, but this is the important information for understanding how to attack a poor CORS configuration. To truly understand what is happening under the hood with both Same-Origin and CORS, it’s important to remember that the web browser is what’s making the decisions about what scripting activity is allowed. 1. The Victim Web Browser visits MaliciousWebSite.com. 2. MaliciousWebSite.com provides a malicious script that instructs the Victim Web Browser to make a request that includes cookies to MyBankAccount.com. The Origin of this malicious code is “https://MaliciousWebSite.com”. 3. The Victim Browser dutifully submits the request that includes any cookies it has stored for MyBankAccount.com. This could include session cookies. 4. MyBankAccount.com responds with private bank account information such as account balances, PII, etc. The Origin of this response is “https://MyBankAccount.com”. 5. The malicious script running in the Victim Web Browser attempts to access the response coming back from MyBankAccount.com. The Victim Web Browser compares the origin of the malicious script to that of the response. Because these two origins differ, the malicious script is unable to access the response containing the private data. 1. 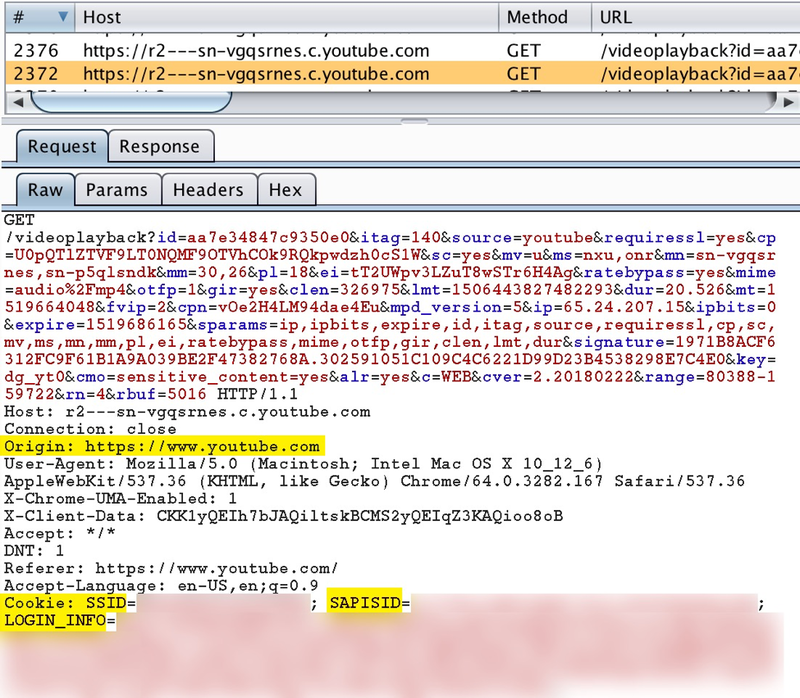 By including an “Origin” http request header, the YouTube HTML5 video player running in the browser indicates it wants to make a cross-origin request to access audio and video content on https://r2—sn-vgqsrnes.c.youtube.com. In this case, the video player’s code came from https://www.youtube.com, so the browser indicates that URL as the Origin. Because the requested video is private, the video player also chooses to send cookies that are in scope for the cross-origin request. 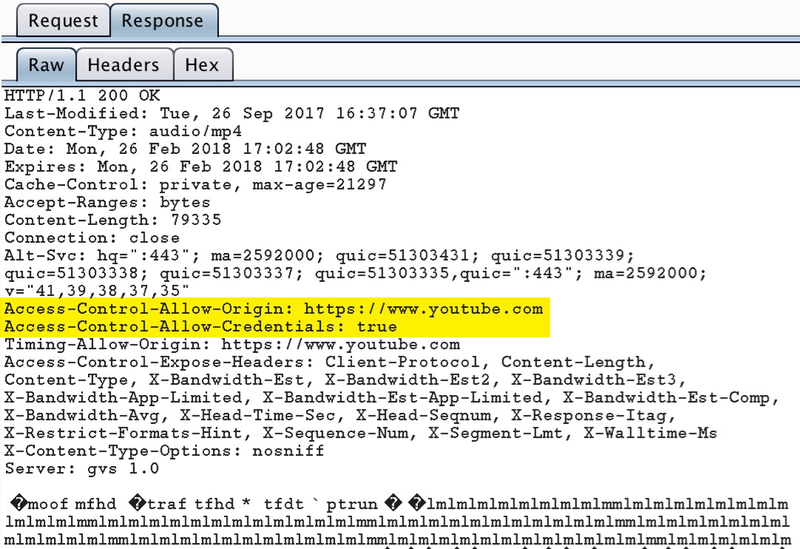 This response header indicates to the browser that only code from the origin “https://www.youtube.com” should be permitted to read the information in this response. This response header indicates to the browser that it’s okay for allowed origins to read the information in this response even though cookies were used to get this response. 3. The browser receives the response from the content server https://r2—sn-vgqsrnes.c.youtube.com. Important: at this point, the HTML5 player has not been given access to the audio/video data from the reply; the browser has only received the response and is storing it in memory. 4. The browser determines if the video player is permitted to receive the response (which the browser has already received). The browser checks the Access-Control-Allow-Origin response header to see if it matches the origin of the code for the HTML5 video player. Additionally, because this is a response to a cookied request, the Access-Control-Allow-Credentials response header must be true. Note: As mentioned before, the browser is in charge of the security decisions in Step 4. The content server is only providing Access-Control response headers to the browser so the browser can decide what should be permitted in the processing of the response. 5. After the CORS response headers pass all security checks within the browser, the response data is handed over to the HTML5 video player code to allow the video to begin playing. If these CORS checks fail, the browser defaults to enforcing Same-Origin Policy. Now let’s build on the Same-Origin Policy chart to include CORS logic. 2. MaliciousWebSite.com provides a malicious script that instructs the Victim Browser to make a request that includes cookies to MyBankAccount.com. The Origin of this malicious code is “https://MaliciousWebSite.com”. 3. The Victim Browser dutifully submits the request that includes its MyBankAccount.com session cookies. 5. 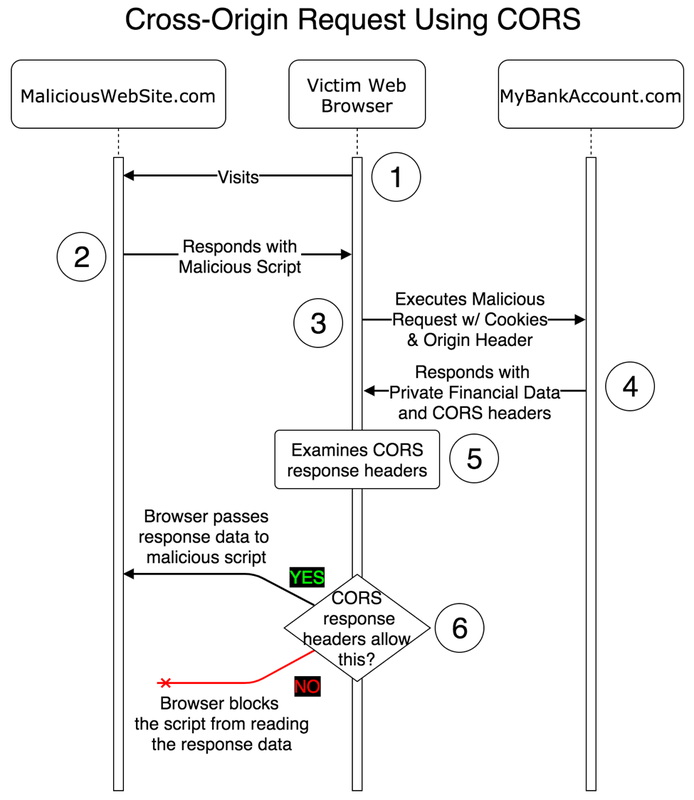 The Victim Browser receives the response and examines the CORS headers to see if MyBankAccount.com indicates code from the origin “https://MaliciousWebSite.com” is permitted to read the response. 6. 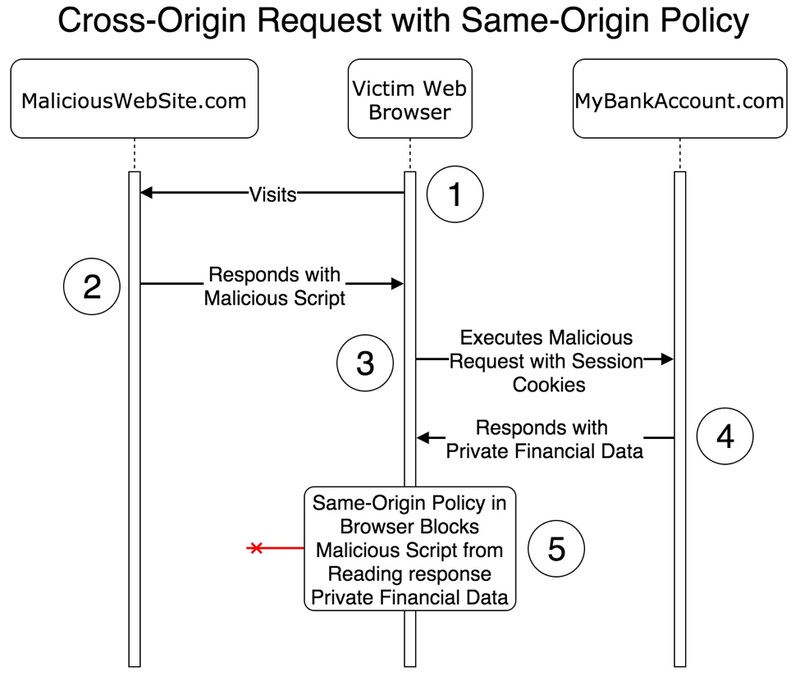 If the CORS response headers from MyBankAccount.com permit cookied, cross-origin communication to the origin https://MaliciousWebSite.com, the Victim Browser will give the malicious script access to the response contents containing private financial data. If the cross-origin communication is not allowed by the response headers, the browser will enforce Same-Origin Policy and block the Malicious Script from reading response content. Hopefully by now I’ve made it clear that if a web server trusts arbitrary origins and also allows cookies/credentials to be passed, code from any web server on the Internet can potentially steal private user data when visited by the victim. Here’s a demonstration of exploiting a faulty CORS configuration to exfiltrate private user data. a. Use Burp Suite’s Repeater to add an “Origin” HTTP header to a request that returns private user information. The origin can be anything for the purposes of discovering this vulnerability. If the response contains both Access-Control-Allow-Origin: [your arbitrary origin] and Access-Control-Allow-Credentials: true headers, prepare to cause a ruckus. b. Or use Burp Suite’s Scanner to perform an active scan on a cookied request that returns sensitive user information. If you receive a red, high-severity CORS arbitrary origin finding, you’re good to go. https://github.com/trustedsec/cors-poc. corstest.html handles auto-submitting the cross-origin request, and cgi-bin/postlogger.py listens for the private data that is POSTed by corstest.html. 3. Spin up the web server to serve up our script. One really easy way to accomplish this is to cd to the directory containing corstest.html, then run python3 -m http.server –cgi. Be careful where you run this from; it will serve all the files in the current and sub directories over HTTP on port 8000. 4. Direct a user that is already logged in to the target application to execute the script we configured. In practice, this could be done any number of ways including phishing, cross-site scripting, malicious advertisements, etc. 5. Watch the logs on the web server. If the exploit was successful, you’ll see POST data from the victim’s browser. Q: What about when the target server responds with Access-Control-Allow-Origin: * and Access-Control-Allow-Credentials: true? A: A wildcard may look dangerous here, but web browsers are configured to disallow cross-origin communication with credentials in this configuration due to how dangerous it would be to allow lazy developers to use this. 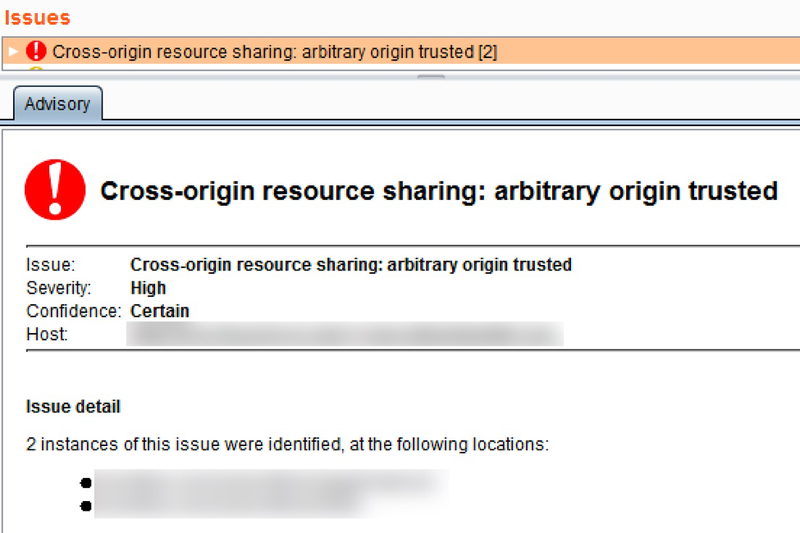 An explicit origin must be called out in Access-Control-Allow-Allow-Origin for browsers to permit cookied cross-origin requests. Q: What if Access-Control-Allow-Credentials isn’t set to ‘true’? A: Extracting private user data will not be a possibility because the browser will not process responses that were from a cookied request. This is the blog post that finally broke through my ignorance of CORS and its security implications. It offers information on more varied attacks than the one I walked through. Highly recommended. These are great resources for getting a better understanding of Same-Origin Policy’s quirks that may not have been spelled out in this blog. 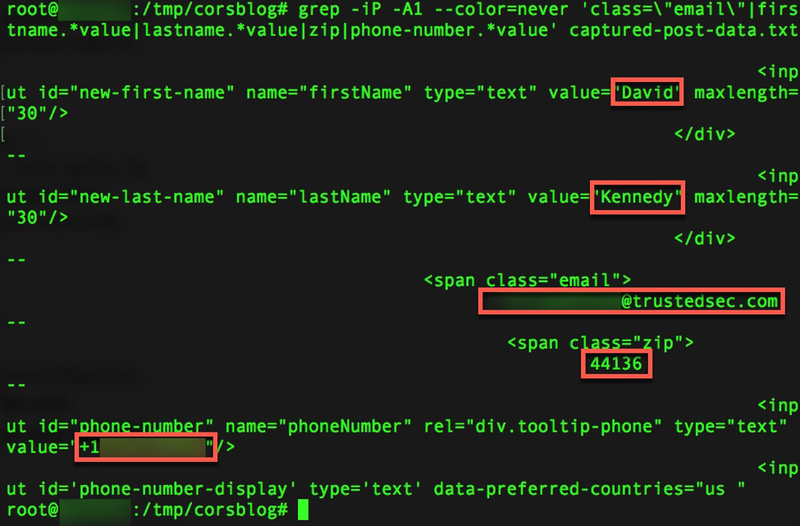 Read this if you want an even deeper understanding of CORS including some features that fell outside the scope of this blog post such as CORS preflighting. 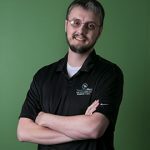 Ryan brings 4+ years of penetration testing and vulnerability management experience built on a mixed history of administering Windows/Linux server, enterprise VMware, and Cisco products. Ryan specializes in web application pentesting to provide knowledgeable application of advanced tactics to identify security issues in web applications and services. The use of test-driven python programming to develop new toolsets and automate existing processes allows Ryan to deliver tremendous value.